My children have been through this audio set of Naria at least 4 times. The album lives in our van, and is very often on during our drives. If you have kids, this is a great family treasure. The Focus on the Family Radio theatre version is fully dramatized with sound effects, music and a great cast. 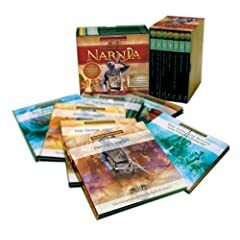 It covers C. S. Lewis’ entire Narnia series. This has been something we’ve given to many of our friends and family who have kids. ChristianAudio is offering Spurgeon’s classic book ‘All of Grace’ on audio for free download. Get it before this month runs out. Use the coupon code OCT2008 to download it for free. John Bunyan’s classic allegory, ‘The Pilgrim’s Progress’ is available as a free download for this month only. Use the code JUN2008.